Another space craft launched. Another mysterious disappearance. Yet more astronauts deposited on a world where man once ruled supreme. Yup, it's time (ahem) to RETURN TO THE PLANET OF THE APES. RPOTA was the last gasp of the original Apes screen franchise. The movie series had expired in disappointing style with BATTLE OF THE PLANET OF THE APES in 1973 and the 1974 POTA live-action TV show (a masterclass in reusing warehoused masks, costumes, props and sets stockpiled by the five film movie series) couldn't even make it into 1975. Running out of options, and pandering to the Apes saga's younger audience, Fox rolled the hairy dice again and came up with this short-lived Saturday morning TV co-production with animation house DePatie-Freleng (later to become Marvel Productions) which aired in the States from September 1975. Ironically, Saturday morning masters Joe Ruby and Ken Spears had been drafted-in by CBS in an attempt to kick-start the scripts on the floundering live-ation show. RPOTA revolved around (yet another) three astronauts dumped onto 'Ape Earth'. Except this was a more technically advanced ape civilisations than the price-sensitive ones seen in the film series. 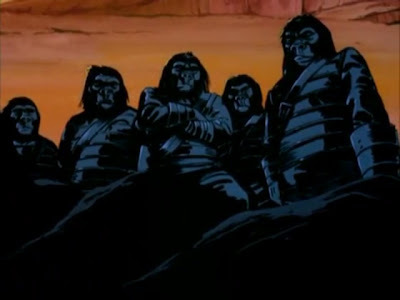 Throwing continuity further into confusion, this version also includes regular apes named Cornelius, Zia, Urko and Zaius. Such muddles of time haven't stopped fans pondering the cartoon's place into the overall saga. The animation was stylish, making a virtue of the fact that there's frequently no animation at all. The camera pans lovingly across static images or, if movement is required, its kept to the barest minimum. Watchers of more than one episode will also spot the familiar Saturday morning shortcut of recycling certain movements, shots or locations multiple times across multiple episodes. That said, the show does have visual appeal and the writing is generally solid and of a fairly high standard considering its target audience and the restrictions of the Saturday morning censor. Unusually for Saturday mornings, the NBC series told a continuing story across its thirteen instalments. However (just like its live-action predecessor), the network axed the show before the final fate of the time travellers could be revealed. Somewhere, in the distant future, elderly astronauts are still dodging dragons and apes driving jeeps. In the UK, the show (like its predecessor) aired on ITV. Its been seldom-seen on TV since but has resurfaced on DVD allowing a whole new generation of Apes fans to marvel at this oddity of crude animation. Marvel's comics license didn't extend to either of the small-screen incarnations.